A couple of days ago we got a tip that the upcoming Jeep Wrangler pickup truck would be called the 2020 Jeep Gladiator, and now it seems official images have leaked confirming the new name. It looks—well, it looks like a Wrangler pickup! The photo popped up on JeepGladiatorForum showing the truck in all of its crew cab glory. Reportedly, the photos are from a Jeep media site that was quickly taken down this morning. We can clearly see styling elements from the new Wrangler on the grille, headlights and taillights, and even a soft top option, but beyond that, no huge surprises here. 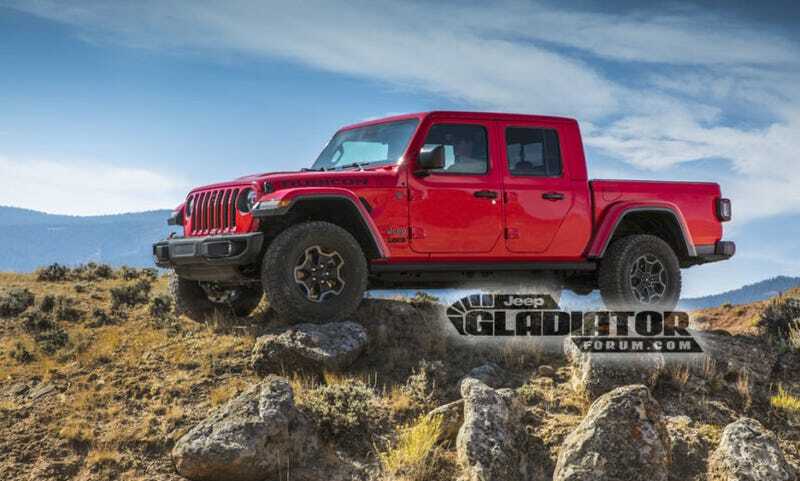 Update, 1:57 p.m.: According to a screenshot of an information sheet about the new Gladiator posted by the forums, the Gladiator will be capable of 30 inches of water fording, a towing capacity up to 7,650 pounds and a 1,600 payload capacity. According to the sheet, it will be available with a 3.6-liter V6 or 3.0-liter EcoDiesel V6, and can be optioned with either a 6-speed manual or 8-speed automatic. We’ll update more as we get it.